This week, I’m excited to bring another guest blog by one of the best vendors in the country, Freckles & Fern. A boutique stationary studio with a focus on modern, luxury wedding paper goods, Freckles & Fern was founded by sisters Avril and Katie, specifically for couples who value unique and thoughtful design. Established in 2017, Freckles & Fern was the product of the sisters love of paper and design and all things wedding-related. “Our mission is simple: to create high quality, well-designed stationery that we would want for ourselves”. 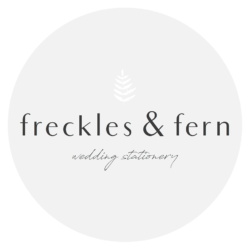 Based on the Antrim coast, Freckles & Fern are most proud of the individual attention provided to each and every couple when creating their wedding stationery. By combining their house collections with options to customise colours, fonts, wording and layout to suit your story, together you can create the perfect paper goods to reflect the style of your big day. Apart from gorgeous design, it’s the little details that will make your stationery unique – Freckles & Fern offer so many pretty extras like silk ribbons, belly bands, wax seals and envelope addressing. They know how important it is to create a cohesive statement with your wedding stationery. With this in mind they offer a full range of matching items like menus, place cards, table plans and much more. You can follow Freckles & Fern on Facebook, Instagram, or online at www.FrecklesandFern.com for the all the latest.